What people say and what they withhold matters. Language trumps control. How the communication is initiated and conducted is often more important than what is communicated. An organization is a network of person-to-person work conversations during which information and energy is exchanged. Like cells in your body, the quality of these "work-atoms" determines the effectiveness of the whole. Attending to and influencing work conversations can help transform culture and improve collaboration. What's most interesting to me is that while our dialog is a reflection of all the soft stuff like trust, openness, honesty, engagement, motivation, transparency, confidence, and respect; dialog can also be viewed as a "technology" in the sense that it can be structured, measured, and guided through specific practices. One can readily observe and monitor what dialog is occurring and, in turn, what culture is being expressed and reinforced. Interventions to improve culture by changing the dialog can, therefore, be quite specific, not just platitudes like "we need more trust". Another intervention involves paying attention to the structure of work conversations. Over the last 50 years social scientists and linguists have developed, for example, a precise model for a "conversation for action" that has four stages. 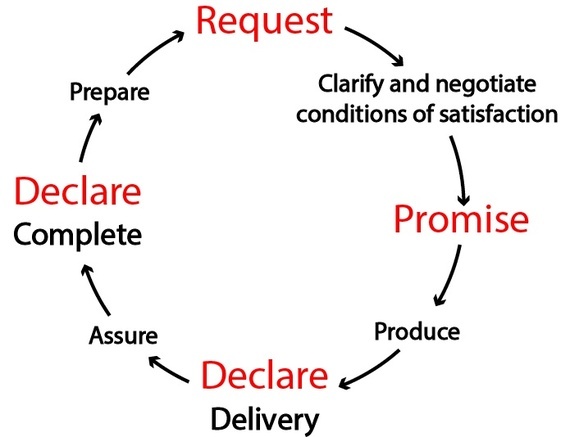 In the first stage the team leader/manager/customer makes a request of a specific performer and the two parties begin the negotiation stage. Once they reach agreement, the conversation moves to the delivery stage. When the performer delivers they enter the acknowledgement/assessment stage where the requester declares whether they are satisfied and completes the conversation. Tracking conversations around this closed loop can be a big boost to better accountability and more on-time deliveries. Language is both the expression of culture and the lever for changing culture. The "technology of conversations" is a new domain that HR practitioners should become involved with. Organization consultants bring special sensibilities and tools for exposing, exploring, and enhancing work conversations. David Arella is the CEO/Founder of 4Spires, creator of the CommitKeeper solution for creating, tracking and delivering work commitments. He has been pioneering advances in people and work management technologies for over 20 years. Dave was the first manager of HR Systems, Technology and Innovation at Apple Computer. In the 1990's he led the teams that implemented the first generation solutions for online compensation planning, resume capture-search-retrieval systems, employee knowledgebase systems, organization charting, employee service centers, benefits enrollment, training administration, and executive reporting. Dave is passionate about the role of technology to achieve organization transformation.